Friday’s rally provided a welcomed start to the New Year as all of the major indices posted solid gains. For the week, the Russell 2000® Index (3.20%) led all of the major indices, followed by the Nasdaq (2.34%), S&P 500® Index (1.86%) and the Dow Jones Industrial Average (1.61%). Consumer sentiment rose on positive employment data, and comments by Federal Reserve Chairman Powell. Friday’s release of the December employment report included 312,000 jobs in December, the largest monthly increase since February 2018. Also, adjustments to the two prior months added another 58,000 jobs. Unemployment edged up to 3.9% as more people looked for jobs. Wages rose 0.4% in December for an annual increase of 3.2%. Chairman Powell’s comments on Friday provided an assuring message. He stated “As always, there is not a preset path for policy” and, “With muted inflation readings that we’ve seen coming in, we will be patient as we watch to see how the economy evolves.” He vowed that the central bank is “prepared to adjust policy quickly and flexibly” if necessary. China’s central bank also lowered reserve rates to encourage small business lending; the government also confirmed that mid-level trade talks with the Trump Administration are scheduled for this week. Taken together, these events appear to have dampened concerns about a possible recession while providing a more positive outlook for 2019. Friday’s 746 point gain in the Dow reversed Thursday’s selloff. Most analysts attributed the selloff to Apple’s announcement, after the market close on Wednesday, of its first revenue shortfall in fifteen years. The company cited lower iPhone sales in China. Investors faced the conundrum: Was this an isolated issue? Or, did the shortfall presage a trend for other companies in reporting fourth quarter earnings? Trade-related issues may well impact other multi-national companies; but Apple’s problem appears more specifically related to increased competition from Chinese companies offering far less expensive phones with similar, or even enhanced, features. Also, many loyal iPhone owners are delaying upgrades. Overtime, Apple anticipates that apps and services, rather than product sales, will increasingly drive revenues and earnings; the transition, though, is somewhat rocky. The new Congress was sworn in last week; and the government shutdown continues. With Congress adjourned until Tuesday, and no substantive move toward a breakthrough, the shutdown will not likely end before Wednesday; the then 18-day closure will be the second-longest in recent history. A renewed commitment by OPEC countries to lower oil production also helped the equity markets. Oil prices are expected to rise this year as other factors, including lower-than-projected production from fracking activities, contribute to a supply and demand rebalance. The improved market sentiment may provide support until earnings season begins in mid-January. Investors, many of whom were overwhelmed by economic concerns in the fourth quarter, abandoned the markets in favor of cash. After last week’s rally, the markets remain oversold; with new data, the computer-driven programs, though, can buy as dramatically as they sold. Each year our Friend Bob Doll, who is Chief Equity Strategist & Senior Portfolio Manager at Nuveen asset management, gives his view on the new year. His insights are very thoughtful and give us some insight to the year ahead. Below are Bob’s comments for 2019 and how he believes the year will unfold in the Economy, markets and some insight to geopolitical events that could affect your portfolios. 2018 proved to be a “Tale of Two Cities” year, as investors were confronted with a range of contradictions: Unemployment ended the year at nearly a 50-year low and wages have been rising, yet fears of a recession have increased. And corporate earnings were amazingly strong while stock prices sank sharply into correction territory by the end of the year. Investors are now left to question whether solid fundamentals or growing uncertainty will shape the markets. Ironically, 2018 was relatively calm until the fourth quarter. Outside of a brief correction in January and February driven by fears of rising interest rates, investors focused on an accelerating economy and strong earnings growth. Stock prices rose to record levels by the end of the summer. What happened over the last three months? Stocks may have reached overbought levels by the end of the summer, so it wasn’t shocking to see a selloff. But the magnitude of the decline has been surprising. We see two primary drivers of the current selloff. First is a genuine fundamental issue of higher interest rates and inflation. Neither has been moving strikingly higher, but they have advanced over the last 12 months, compressing equity valuations. Second, consider a large list of worries: concerns over slowing economic and earnings growth and trade issues are the most prominent, but investors are also worried about Brexit, the Italian budget stalemate, falling oil prices, political dysfunction and uncertain Federal Reserve policy. With this somewhat confusing backdrop, Bob offers his 10 Predictions for 2019. The U.S. expansion becomes the longest in history despite GDP slowing to a still-above-trend increase of 2% to 2.5%. Unemployment bottoms in 2019 while wage growth continues to rise. The Treasury yield curve flattens and credit spreads widen due to late cycle concerns. Corporate earnings growth estimates weaken for 2019 and 2020 as both revenue and profit pressures rise. U.S. equities experience a positive return, but fail to reach record highs for the first time in 10 years. Non-U.S. stocks outperform U.S. stocks as the dollar sags. The information technology, financial and healthcare sectors outperform utilities, REITs and materials. The annual federal budget deficit approaches $1 trillion, a level unprecedented absent a recession. U.S. and global politics spark more market volatility as the cold wars within the U.S. and with China persist. A double-digit number of Democrats run for president while President Trump is challenged within his own party. We have many questions, but we think it is fairly certain that the U.S. will not fall into recession in 2019. We don’t see any signals that make a reasonable case for recession. The consumer sector looks strong, particularly the labor market. The corporate sector is solid, although corporate management teams have scaled back some plans due to trade concerns. And the government sector appears to be expanding, as spending is likely to rise. We expect growth will slow next year compared to 2018, but to a still-above-trend 2%+ level. However, we can easily make a bullish or bearish case for stocks. We could argue that recession fears will likely fade as data continues to be positive. Should that happen, stock prices could again rally on decent fundamentals, especially since valuations are more attractive now than they were a few months ago. Conversely, even if the economy continues to grow, investors will become increasingly concerned about slowing earnings growth. They will continue looking for reasons to sell, which could produce a trendless or even falling market into 2019. But, at the end of the day, as professional investors we are obligated to make a call and lean toward a constructive view on equities. As the title of our predictions suggests, we think markets will remain choppy and frustrating and stocks will bounce around with extended runs and declines. Ultimately, we think the bullish factors will generally overpower the bearish ones. We expect 2019 market performance will be stronger than 2018.We think a reasonable year-end target range for the S&P 500 Index would be around 2,650, meaning a decent gain for stocks. To get there, recession fears cannot be realized. As volatility remains elevated, we think 2019 will be a difficult environment for investors. Remaining selective and tactical would seem to be the order of the day. Long term investors may want to add to positions during periods of weakness and trim holdings during periods of strength. The equity markets certainly took investors on a wild ride in the holiday shortened week. On Monday, the Dow Jones Industrial Average lost 650 points; on Wednesday, the markets rallied with the Dow gaining 1086 points, its largest one-day gain in history. On Thursday, extreme volatility drove the Dow down over 600 points before reversing course to close up 260 points. 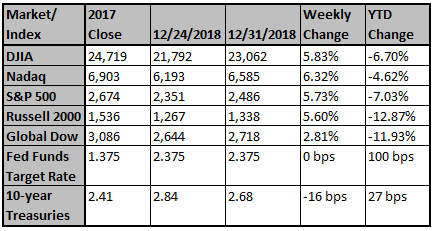 For the week, the major indices posted gains for the first time in December, the Nasdaq rebounded from bear market territory gaining 3.97%; the Russell 2000® Index rose 3.55%; S&P 500® Index rose 2.86% and the Dow gained 2.75%. During the week, the Dow, the S&P 500® and Russell 2000® narrowly missed entering a bear market before the rebound. Year-to-date, though, the Dow, the S&P 500® and Nasdaq are on track to post their first annual losses since 2008. Analysts suggest that the major culprit in the dramatic selling action is the concern that the global economy is slowing, or that a recession is looming. Later in the week, the rebound seemed driven either by those who bought in an oversold market or discounted fears of an imminent recession. The automated processes of quantitative trading programs, which account for approximately 85% of all trades, are likely responsible for the extreme volatility. Their trading formulas are closely held secrets; and yet, the algorithms that each utilize incorporate price movements and other data. They often move in lockstep as each feeds off the others’ program decisions. Passive investors, which simply follow market momentum, add to the mix. The problem created by the computer models is that they cannot correctly analyze all data events and human behaviors; as a result, their actions may create unintended consequences, including volatility. Active investors must, therefore, adapt to the challenge by utilizing market volatility to advantageously buy and sell stocks. Even so, active investors oftentimes allow the markets to settle down before initiating significant changes. Following a strong nine months of 2018, the year is ending in disappointment. The markets seemed overwhelmed by myriad events which overshadowed the health of the U.S. economy. Several geopolitical events, including a divided Congress, trade disputes, monetary policies, Brexit, and oil prices will demand attention. By mid-January, the fourth quarter earnings season will provide an important barometer in gauging both the health of the economy and the outlook for the New Year. Many stocks are greatly undervalued; they will recover as headline events reach resolution and earnings reports shed more light on the outlook for individual companies. Best wishes for a prosperous and Happy New Year!